Get two kickin' tales in one book with this illustrated chapter book based on popular episodes of Kung Fu Panda: Legends of Awesomeness.This chapter book contains two stories, both based on episodes of the popular and Emmy Award-winning television show Kung Fu Panda: Legends of Awesomeness. This book includes black-and-white illustrations throughout--and plenty of action! In the first story, there seems to be a sudden rash of thefts in the Valley of Peace. The Furious Five want to help find the thief, but what should they do when all the evidence points to Monkey? In the second story, Crane has lost his confidence and wants to leave the Furious Five. 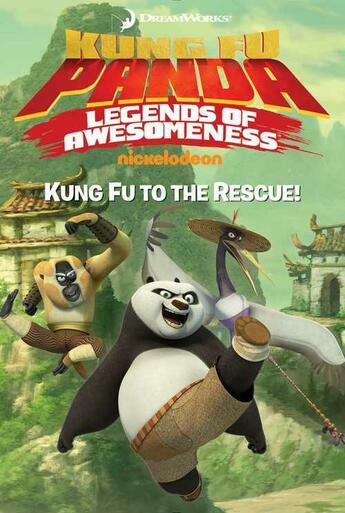 But when an old enemy appears, it's up to Crane to save the day.Kung Fu Panda Legends of Awesomeness © 2014 Viacom International Inc. NICKELODEON and all related logos are trademarks of Viacom International Inc. Based on the feature film "Kung Fu Panda" © 2008 DreamWorks Animation L.L.C. All Rights Reserved.